Located at Birr Library for the month of July and all are welcome to attend. 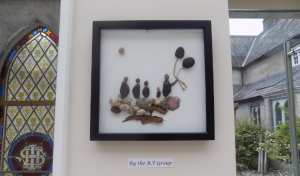 The group decided they would like to use rocks, sea shells and other natural materials in creating their pieces and they visited Dromineer to gather their pebbles and shells. This project was very much enjoyed by the R.T. group and we hope you enjoy it too.